Earlier this month, Roma forward Francisco Totti picked up his 225th Serie A goal in a match against Genoa. 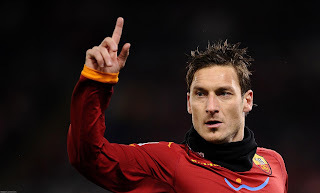 That goal tied Totti with Gunnar Nordahl for second place on Serie A's all-time scoring list. Totti, who is 36, made his debut with Roma back in 1993 and was part of Italy's 2006 World Cup winning squad. The number one all-time scorer in Serie A is Silvio Piola, who scored 274 goals. Totti has indicated a desire to play into his 40s and to beat Piola's record, it seems unlikely that will happen, but only time will tell.